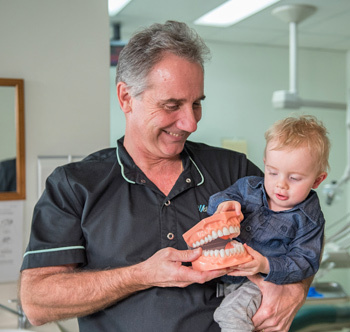 As a father, Dr Stephen Suster has always had a special place in his heart for paediatric dental patients. He takes his time with each child so that they can thoroughly enjoy their visit as much as possible. Being able to create a positive, educational experience allows us to help children avoid dental diseases in the future, most of which are preventable in nature. We believe familiarising your child with dental care at an early age can help them have a positive outlook on future visits. 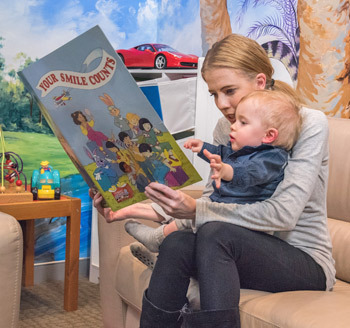 Our Menai dental clinic is designed with a playful scene painted in the corner of the waiting room, and a treasure chest for our young patients to collect prizes after their visit. Vision Dental is truly a place where your entire family can feel at home. Assessing your child’s bite at an early age can help them avoid complex orthodontic needs later on. Our Menai dentist offers screenings as well as early orthodontic treatment (braces) for children of all ages. We also work with an Oral Myologist to identify underlying causes of orthodontic problems. File insurance claims on the spot with our in-house HICAPS machine. Medicare and CDBS is gladly accepted. If you don’t have insurance, we also offer 0% interest free financing on all treatments, including braces. Vision Dental offers no gap dental care, as well as bulk billing. Be sure to take advantage of the $1,000 in children’s dental services available. Schedule your child’s checkup with us today. We recommend bringing your son or daughter in by age 2, and routine cleans with our hygienist every six months. Contact us today to get started.